Dive into these flavorful, tender grilled turkey burgers, livened up with a delicious and easy curry hummus. You may never go back to regular burgers! 255 calories and 6 Weight Watchers Freestyle SPThank you to Sabra Hummus for helping me to share this recipe with you. Simply because I work and immerse myself in the food and cooking world everyday, I come into contact with a lot of ingredients that may not be as familiar to some of my readers. Sweet potato noodles, barramundi, tart cherry juice…you get the picture. There’s one particular ingredient that I use a lot (A LOT!) in my cooking that didn’t strike me as unusual in the past. But an experience in the past couple of weeks changed that. 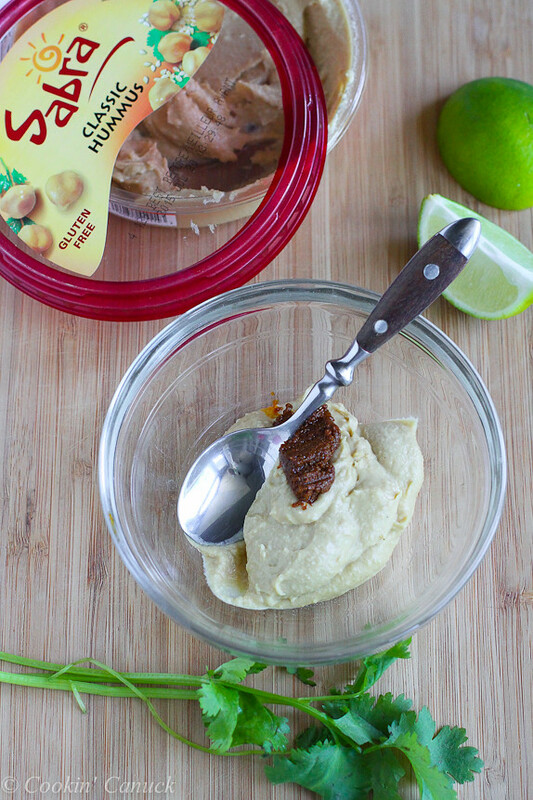 A couple of weeks ago, I joined a group of fellow bloggers in Richmond, Virginia to learn more about the Sabra Dipping Co. and the product that launched it all for them…hummus. 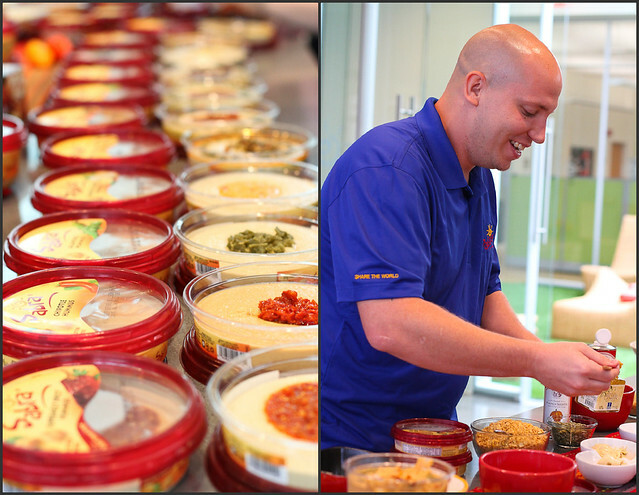 While talking with the Sabra team, I was really surprised to learn that one of their challenges is introducing the general public to hummus and how many people aren’t familiar with the Middle Eastern dip. Sure enough, when we hopped into a taxi to head to dinner at The Daily Kitchen & Bar (I highly recommend it! ), we got into a conversation with the driver about hummus. He had no idea what we were talking about. He was truly curious about this new-to-him dip, but had never had the opportunity to try it. It made me realize how much I take for granted the privilege to try different and exotic foods. It’s blissfully simple, healthy and delicious. The basic ingredients are chickpeas, tahini (sesame paste), garlic, lemon and olive oil. The beauty of the versatile dip is that it is fantastic “as is”, used as a dip for veggies or crackers, or with various garnishes. Sabra is the king of adding garnishes, such as roasted red peppers, olive tapenade (one of my favorites), roasted garlic and jalapeños. Really, that’s just skimming the surface. The list goes on and on, with each one being as delicious as the next. We had the opportunity to try the two new flavors that will be coming out – Rosemary with Sea Salt and Caramelized Onion. Let me just say you will definitely want to sample these flavors! Left: The hummus tasting table! Right: Pete Taylor of Spiceologist, whipping up his favorite hummus concoctions from the Sabra Hummus House, Sabra’s first pop-up restaurant in Washington, D.C.
We had the opportunity to make our own hummus garnishes, from a huge array of veggies, spices, fresh herbs and other ingredients. My creation was Sabra’s classic hummus, topped with pumpkin pesto, cilantro, chopped almonds and pickled celery. This is one I’ll be recreating at home! The beauty of hummus is that it’s fantastic (and may I say completely addictive) on its own, but my family also uses it on burgers – turkey, salmon and others – and in place of mayo and mustard on sandwiches. But that’s just the tip of the iceberg. Who knew that hummus was so versatile, right?! But really, if you just get as far as dipping veggies into it or spreading it on a burger or sandwich, you will become hooked! Turkey burgers are notorious for being dry and unappealing, but it’s time to change their reputation! I keep it pretty simple when I make the patties – no egg, no breadcrumbs. I just use lean (not extra-lean…we need a little bit of fat to keep things juicy) ground turkey and some seasoning. That’s all they need, I promise! In this case, I dolloped in a tablespoon of mild curry paste, and a pinch of salt and pepper. The trick is to grill the burgers until they are just cooked through. In other words, don’t grill the living daylights out of them. With thin patties like these ones, it will take 2 to 3 minutes per side for the patties to be cooked through. For the hummus, I used Sabra’s Classic Hummus as a base, and mixed in some of the same curry paste, a squeeze of lime juice and a sprinkle of minced cilantro. The flavors will make your taste buds jump with joy! Preheat the grill to medium-high heat. Light oil the grill. In a medium bowl, mix together the ground turkey, curry paste, salt and pepper. Divide the turkey mixture in 4 equal portions and form into patties, about ½ –inch thick. Place the patties on the grill and cook until just cooked through, 2 to 3 minutes per side. Lightly toast the hamburger buns. Spread 1 ½ tablespoons curry hummus on each of the buns. Divide the cooked patties, tomato and lettuce between the hamburgers. Serve. In a small bowl, stir together the hummus, cilantro, curry paste and lime juice until well combined. Disclosure: This post is sponsored by the wonderful team at Sabra Dipping Co. All opinions are my own. I am a participant in the Amazon Services LLC Associates Program, an affiliate advertising program designed to provide a means for me to earn fees by linking to Amazon.com and affiliated sites. I am loving the curry addition!! So glad you had so much fun on the Sabra tour!! It was such a great trip!! Thanks, Liz! Yes, it was such a great experience to visit Richmond (a first for me) and to learn more about Sabra. I could eat their hummus all day long. I introduced my husband to hummus- he had never even heard of it before. But now it’s a staple in our house. 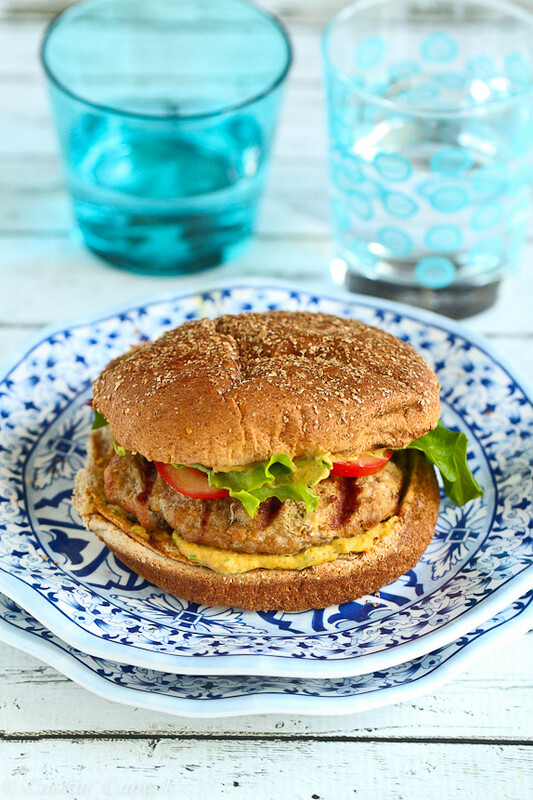 And I love this curry twist to these burgers! Great minds, right? 🙂 We adore slathering hummus on our burgers – it really changes the flavor profile, in a very good way. What a great trip you must have had. And I love the curry in this hummus! Thanks, Martha! It was indeed a great experience. Sounds like fun! 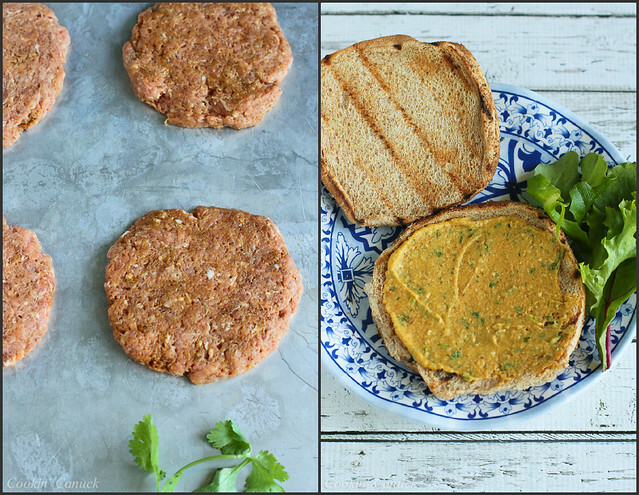 I love hummus and it sounds so good with a turkey burger! Thanks, Stephanie. It really is a great flavor combo. I promise that you’ll be hooked! What a great idea to use hummus on burgers! Thanks, Paula. It’s a favorite here! Thanks, Theresa. It was great to meet the amazing team of people behind hummus and see where all of the hummus magic happens. Looks great! Hummus and pita chips are two things that I love together. And turkey burgers? Can’t get enough of them! Thanks, Brooks! Oh yes, you can’t beat hummus with pita chips. Yes! I read an article about Sabra in a magazine (I think it was Fast Company?) last year, and it was mostly about how they have a huge job ahead of them to educate people about what hummus is. It was really interesting, and I had no idea before reading that! I think hamburgers / turkey burgers like this one are a really perfect way to introduce a hummus newbie to the wonders of the hummus world! Thanks, Lori! Sabra is doing some great things to get the word out about hummus and to encourage people to try it, such as introducing Sabra tasting trucks in various cities. Sounds like you had a wonderful time. 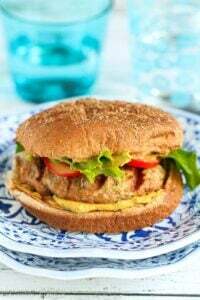 Never would of thought to add hummus and curry to a turkey burger, sounds delicious! Sabra is the best! Their products and people are top notch 🙂 This turkey burger is totally jazzed up with the curry hummus…I want! I am like a hummus addict! Sabra has such creamy and very flavor types of hummus, it is hard to chose which one is the best! These burgers are excellent for the summer grilling season! This is such a great idea! 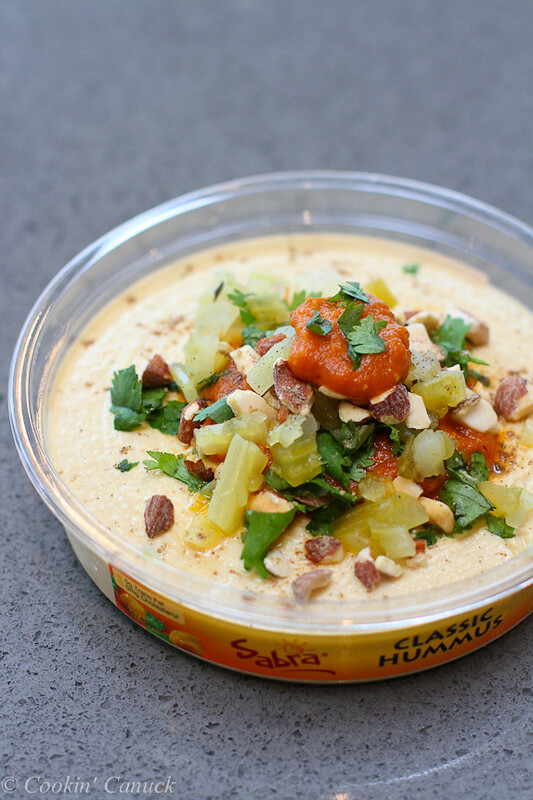 I am a HUGE fan of Sabra hummus – I always have it around! This curry hummus is GENIUS! I am going home and making it tonight! I am so so happy I got to meet you! Love the sassy addition of curry to this too and thank you for linking up to my recipe! Basically, you are my hero . I’ve never thought of hummus on my burger but you make it look so good! And adding some curry is a great touch! My family loves hummus! Definitely need to remember this recipe next time we have burgers. Isn’t hummus great?!?! I could eat is plain…looks delicious!